To get technical support for free with your evaluation or Team Edition product, send us an email at support@infolibcorp.com or connect with an agent on live chat on this site. Technical support hours of operation are Monday-Friday 9-5 EST. When you become a priority support customer, you will be able to log into your own downloads portal area where you will have access to the latest updates for all your products, licenses, and product keys, and have access to priority telephone support. To access the trouble ticket system, click the link below. This is a self service feature where you can sign up, and a password will be emailed to you. Once you create your account, you will be able to create trouble tickets, and access the knowledge base. Evaluation Software Downloads and Intructions. Click this button to be redirected to the download area containing the evaluation download binaries and installation and configuration guides. Visit our Video Tutorials page to view step by step videos and installation and configuration walkthroughs. Obtaining Metadata Adapters and Templates. If you are already a customer, please log into our priority support site here to create and manage your customer support tickets and to download updates, adapters or templates. The InfoLibrarian™ product is also bundled with comprehensive documentation to help you to develop custom adapters for your environment. Need Help with Custom Adapters, Templates or other Customization? If your are looking for additional help on custom adapters or wish to have us complete a custom adapter for you. Rates for off-site development. On-Site consulting is billed on a time and materials basis. OLEDB Import Adapter™ (Oracle, SQLServer, DB2, MySQl etc). SQL Server Adapter™ (Relational, SSIS, SSRS, SSAS). XML Adapter ™ (XML, XMI-CWM). Delivering metadata management and data governance best practices, breakthrough product knowledge and real world experience to you in a convenient time sensitive format. Getting Started: Fun and interactive, introductory courses about how to utilize the InfoLibrarian™ tools. Advanced: Go from 0 to expert in 60 minutes. You'll be an InfoLibrarian™ pro after completing our advanced sessions. Webinars - Web Based Consulting/Demos and Additional Training or Support Industry leading metadata experts are available for an in depth web based metadata demonstration and consultation that is focused on your project needs, specific environmental needs and questions. By participating in our online webinar, your organization will learn and benefit from years of experience and knowledge of best practices, caveats and how to achieve a win with your metadata initiative in the real world. Testimonial "Our group was very impressed with InfoLibrarian™. Even more we were impressed with InfoLibrarian's knowledge and truthful answers to our questions"
All maintenance and new-feature releases of the covered software product, at no additional cost. 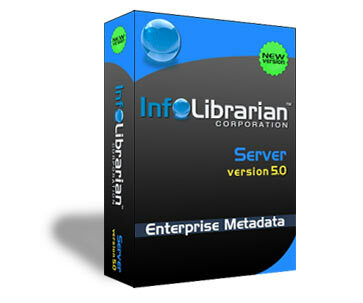 The ability to add additional licensed copies of InfoLibrarian™ at a special price per copy. InfoLibrarian™ provides the opportunity to continue maintenance protection so that InfoLibrarian™ software will always be up to date. Please note that this Upgrade Assurance and Maintenance offer is extended to new InfoLibrarian™ software product users only, and cannot be sold separately. For international orders, customer shall be deemed the importer for all purposes, and shall be responsible for all customs duties and clearance charges. Customer shall also be responsible for all other duties, levies, or government fees or taxes now in force or enacted in the future including, for example, any value-added taxes. Standard Product Support and Maintenance Agreement. All of our products are licensed by package per client site. The InfoLibrarian Enterprise™ software is licensed per Machine instance. Portal client access Licensing is required with our Server product packages. The InfoLibrarian Appliance™ solutions are licensed per site. No Additional CALS are required. Additional Licenses and conditions are quoted when you purchase Upgrade Assurance under the Standard Product Support and Maintenance Agreement. InfoLibrarian Portal™ CALS client access licenses are concurrent. InfoLibrarian Server™ is licensed per Windows server node. InfoLibrarian Studio™ is licensed per desktop seat. Scanners/Adapters are licensed per InfoLibrarian Server™. Desktop Scanners/Adapters are licensed per Seat. (English-Language Version Only) The user license for InfoLibrarian™ software, licensed from InfoLibrarian™ Corporation, is for the English-language version of InfoLibrarian™ software only. The license permits you to distribute the specified number of licensed copies of InfoLibrarian™ software entirely within your organization, solely for use by your employees. The software may be used by your employees worldwide; subject to US export restrictions (see the applicable license agreement). You may not give, transfer or sell multi-user-licensed copies of InfoLibrarian™ software to your customer(s), or any third party, nor include such copies in, or with, products you sell. The software is licensed on a per-user basis. Subject to the number of copies licensed by your organization, users may access the software in any way that is convenient; for example, by accessing copies stored on local hard disks or copies stored on network servers. The license is not a concurrent-use license. A InfoLibrarian™ user license for InfoLibrarian™ software entitles your organization to receive one software package and to duplicate the software as necessary for distribution within your organization to the specified number users, in accordance with the applicable license agreement. You may place credit card or telephone orders by telephone at 1-(877)-415-1957 (toll free; US only) or O11- 941-462-3000 (International) All sales and use of InfoLibrarian™ software and hardware are subject to the terms of the applicable license which accompanies the product. You also may fax a purchase order. Purchase orders are subject to credit approval and, if credit is approved, have net 30 day terms. Please include complete billing, shipping and contact information with your purchase order. Currency on purchase orders must be in US dollars. You may fax your order to the attention of the InfoLibrarian Corporation™ Orders Department at 1-(208)-975-7956 *Please note that purchase orders that include, or have attached terms and conditions other than InfoLibrarian Corporation™ terms and conditions, will not be accepted by InfoLibrarian Corporation™. You may also e-mail your purchase order as an attachment to us. *Please note that due to security concerns that are inherent in the use of e-mail, the inclusion of credit card information in your e-mail is not recommended. **Please also note that purchase orders that include, or have attached terms and conditions other than InfoLibrarian Corporation™ terms and conditions, will not be accepted by InfoLibrarian Corporation™. Complete the order form below and either fill in the credit card information, or include a check or money order in US dollars drawn on a US bank.